Renowned as the most complete and thorough line available, this collection of waste containers a variety of colors, finishes and materials for every budget. Featuring side, bottom, top and door mount options; euro and full-extension slides; pull-out and pivot-out functions; all with the high-quality and flexibilty you need. 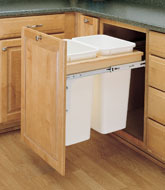 Regardless of the size of the base or sink cabinet that you are buying, there is a waste basket that can fit your need, including a recycling center for the environmentally conscious.